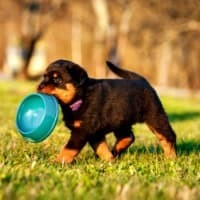 When your puppy is not eating, whether it's just a drop in appetite or he refuses to touch a bite, it's natural to worry. After all, puppies need to eat to grow, and to stay healthy. It's not unusual for a puppy's appetite to fluctuate from week to week, or even day to day, and in a healthy puppy who's otherwise acting normally, this is usually not something to worry about. But if your little Rascal is showing ANY other signs of feeling unwell or it's been twelve hours or longer and he's still refusing to eat, then it's time to start looking for answers. There are many possible scenarios here, ranging from a simple upset tummy (common in puppies who tend to try to eat all sorts of inedible stuff!) to a potentially serious illness. So, how do you tell the difference and figure out why your puppy isn't eating? Does my puppy seem sick? This is an important one because loss of appetite is an early symptom of many dog illnesses, some of them with the potential to be very serious, even fatal. If your puppy is not eating and also showing any of these symptoms then it's vital to get him examined by a veterinarian right away. Of course, a puppy who is throwing up, has diarrhea and isn't hungry could just have eaten something he shouldn't (but isn't toxic) and feels poorly... BUT he could also be showing early signs of Parvovirus, Coccidia, Giardia or a number of other potentially serious illnesses which puppies are at risk of catching. Another possible cause of your puppy not wanting to eat could be a bowel or intestinal obstruction. A blockage like this is a veterinary emergency so if you even THINK little Rascal might have one, get him to your veterinarian right away. Find a 24 hour animal hospital if it's after hours. It's that important. Again, this is due to little Rascal's belief that everything is edible until proven otherwise. He's oblivious to the fact that proving his theory could be very dangerous! If your puppy has ingested something that has become stuck in his digestive tract, basically causing a blockage preventing food from passing through his body as it should. Usually you'll see signs that he's in trouble (in addition to his refusal to eat). These might include vomiting, constipation, pacing, panting or whining and/or a distended belly. Some pups may try to curl up or hide because they don't feel good. In both these types of situation, don't 'wait-and-see', it could (literally) make the difference between life and death for your pup. If I'm stressed I don't feel hungry, chances are you're the same way. Puppies can also lose their appetite when they're stressed or anxious. It's very normal for a puppy not to eat for the first twelve, twenty-four or even forty-eight hours after coming into his new home. All the changes involved in leaving his momma and litter-mates, traveling, and meeting new people (and perhaps other pets) in a new environment put Rascal's little body under a lot of pressure and stress. He may react by refusing to eat, not pooping or sleeping more than normal. Of course all of these can also be symptoms of illness so it's important to have a new puppy examined by a veterinarian as soon as possible after bringing him home. If you've had your puppy for a while and he's adjusted to his new environment, look for other things that might be stressing him out. Puppies and dogs are creatures of habit, routine and habits give them security and confidence. Any sudden, or big, changes in either of these areas can cause stress and that can lead to unusual behaviors, including a loss of appetite. Just to give you a few examples of anxiety triggers for puppies and dogs - moving house, adding a new baby, divorce, starting at doggie daycare or being boarded, adding a new pet... etc. etc. Most pups will adjust within a few days, or a few weeks if the change is a big one, and a healthy pup won't starve himself. If your puppy is playful and interacts with you (even if it's just for short periods), is drinking water, peeing normally and isn't vomiting or having diarrhea, then chances are he's not eating because he's anxious, homesick or stressed. However, if you have any concerns about his health, have him examined by your vet. Better safe than sorry. Have I changed his diet? Puppies have preferences just like children do, and also (like children) tend to prefer familiar foods. If you've changed the food your puppy is eating, it's possible he simply doesn't like it, or is suspicious of it. 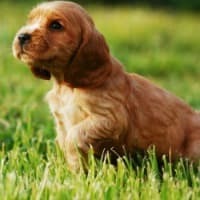 Premium quality, natural puppy food choices, raw puppy food or homemade puppy food are usually tempting to puppies because they smell, and taste, good. Lower quality foods tend to be less appetizing and some puppies simply don't want to eat them. Of course, the price tag on a bag of puppy food is not a guarantee of quality, or that little Rascal will love it, but it does increase the odds that he will. Regardless of your budget, if your puppy is not eating but seems to be perfectly healthy, it doesn't hurt to try a different puppy food as long as you make the change-over gradual by slowly adding the new food and reducing the amount of the old one over a period of several days. But if this doesn't help don't make a habit of changing his food to tempt him, it's more likely to lead to him becoming an even more picky eater than it is to help the situation! When your puppy is teething (anytime between three months and seven months of age, on average) his mouth can be tender and uncomfortable from time to time. A quick look in his mouth will tell you where he's at and what his puppy teeth look like. There may be a little blood at the site of a lost tooth, swelling under the gums where an adult tooth is waiting to push through or a wobbly tooth or two. If you see anything that looks particularly painful, or wrong (ie two teeth fighting for the same spot, redness or inflammation which could indicate infection, or a broken/chipped tooth and so on) have him seen by your vet quickly. Any, or all, of these teething problems can make your little puppy reluctant to chew.. and eating requires chewing, so his appetite may take a nose-dive, temporarily. As long as he isn't showing any other signs of illness, his refusal to eat doesn't extend beyond twelve to eighteen hours, and he is happy and active otherwise, he should bounce back pretty quickly. 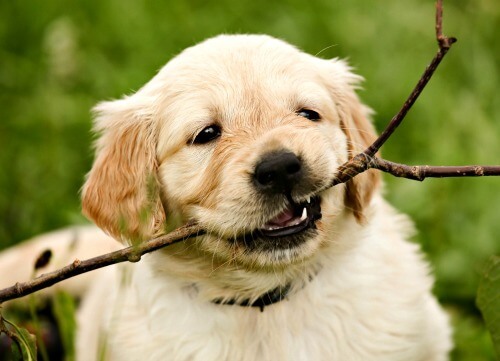 If your puppy is not eating and his mouth is uncomfortable due to teething there are a some puppy teething remedies which may make it easier on him. Has he been vaccinated/dewormed recently or is he taking any medication? Puppy shots can have all sorts of side effects and loss of appetite is one of them. So can puppy deworming medicines. Many other medications also have side effects which can affect little Rascal's appetite and digestive system. 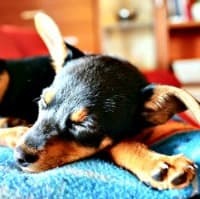 If your puppy doesn't feel like eating because of a reaction to his puppy vaccinations, or has diarrhea and loses his appetite after being wormed, or is on a medication which is causing side effects including diarrhea, vomiting and other digestive issues, then his appetite is going to suffer. In mild reactions loss of appetite and other reactions should generally be short lived. As long as you make sure little Rascal is drinking enough water and isn't showing signs of any serious side effects (hives, swelling, difficulty breathing, extreme weakness, disorientation or collapse) he should bounce back fairly quickly. But, if you have any worries, feel he's not improving, is getting worse, or seems really unwell, have him examined by your vet right away. A healthy puppy won't starve himself, he may not be gobbling down his food as he normally does but he'll eat enough to 'keep the wolf from the door' (as my grandma used to say) . But you might be wondering how long an otherwise healthy puppy can go without eating. There isn't a 'one size fits all' answer to this but in general a mid-to-large-breed puppy could potentially go 36 to 48 hours without food and be alright. Not ideal by any means, but not life-threatening. A small breed puppy is at risk of hypoglycemia (low blood sugar) without frequent meals, so if you have a tiny or toy puppy who refuses to eat for more than 6 to 8 hours I'd strongly suggest talking to your vet because he needs help. Always make sure your puppy is drinking enough water even if he's not eating! A puppy will get dehydrated quickly without water and dehydration can lead to serious problems including organ failure, and even death. The minimum healthy water intake for a puppy is approx. one ounce of water per lb of body weight per day. If your puppy isn't drinking at least this much, you can check his gums for signs of dehydration. Healthy gums feel smooth, and slick, if little Rascal is dehydrated his gums will feel dry and rubbery. Even if you feel his gums are okay, if he's not drinking enough take your puppy to your veterinarian for a check up. He may need IV fluids. 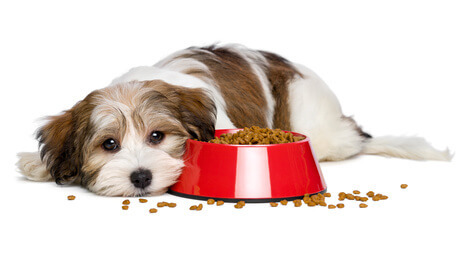 Home › Puppy Health › Why Is My Puppy Not Eating?